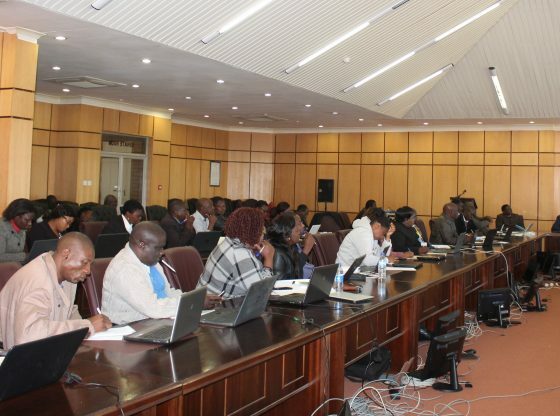 The Midlands State University’s Faculty of Social Sciences, together with the University’s Research and Postgraduate Office, hosted a two-day workshop in collaboration with the Council for the Development of Social Science Research in Africa (CODESRIA) from 21 to 22 June 2018 at University’s Gweru Main Campus. The research workshop was facilitated by Dr L. Maunganidze from the University’s Human Resources Management Department and Professor K. Nyikahadzoi from the University of Zimbabwe’s Centre for Applied Social Sciences. The workshop, which drew over 80 participants from the faculties of Social Sciences, Arts, Commerce, Education, Natural Resources Management and Agriculture, and Science and Technology covered philosophical and methodological foundations of qualitative research and qualitative data analysis and presentation using QSR NVivo, ‘a highly rated qualitative data analysis software package’. Participants were exposed to the epistemological and ontological foundations of qualitative research and how to ensure design coherence. The workshop took a predominantly practical approach, which saw participants learning how to use the QSR Nvivo package. Among those who graced the workshop were Professor Dzingirayi, Overseer CODESRIA, MSU Executive Dean of Social Sciences, Professor C. Hungwe and MSU Senior Research Officer, Dr U. Guyo as well as various DPhil and MPhil students, lecturers and supervisors.